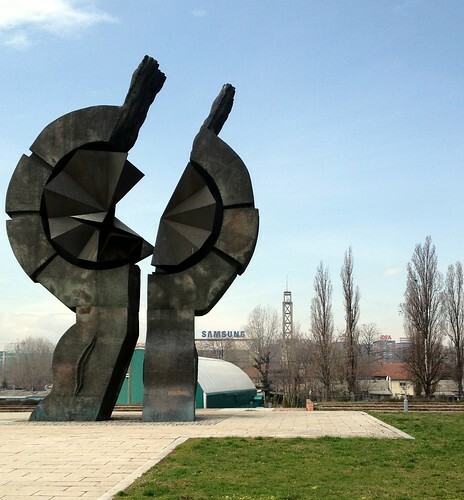 The other day I was walking along the Sava River and I came across the memorial to the Jewish victims of the Holocaust. In World War II, The statue was erected in front of the old fairgrounds that served as a concentration camp for Jews, Roma, and Serbians. You can see the tower in the background. I wonder how many visitors, or even Belgraders understand what took place here. I’ve blogged about the site before. Interesting fact is that Staro Sajmiste concentration camp was at that time on the territory of the Independent State of Croatia, nazi puppet state. The border between the Independent State of Croatia and German occupied Serbia during the Second world war was Sava river.